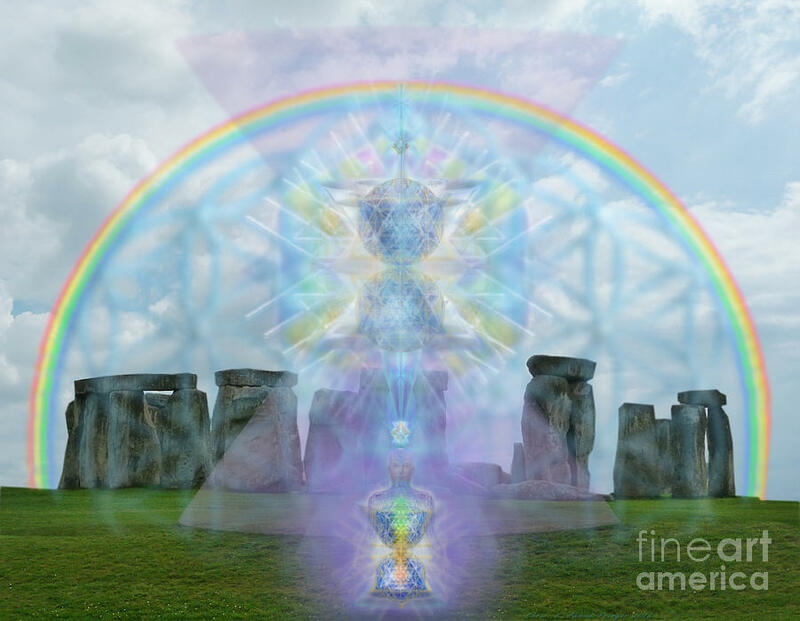 Chalice Over Stonehenge In Flower Of Life And Man is a piece of digital artwork by Christopher Pringer which was uploaded on April 30th, 2016. Symbolically, the "Soul Chalice" 'on high' extends itself as a radiant form into the deep green grassy field, as the "descending Violet Flame "Tube of Light" or Aura around the chalice is extended into "the plane of Matter" around the "Chalice in Man." 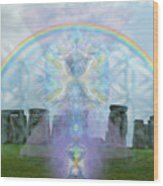 Pi-ratio rays reach out symmetrically through a "Tree of Life" symbol and into it's natural and symbolic source, the "Flower of Life" all girded inside a rainbow-gilded dome symmetrically around the chalice with all suspended over and about the ancient Stonehenge complex. 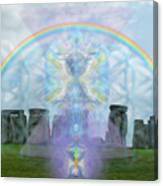 The rainbow here is symbolic of the human energy centers, or chakras, which (for one primary function) transduce (convert) spiritual energies (of very high frequency) into that which we can safely use in our physical bodies. The face of the "chakra man" made from a black & white copy of a photo of Baba Gi (Ravindra Giri or MAHAVTAR BABA), which I blended with some pics of my own face for color, followed by a great deal of touch up. 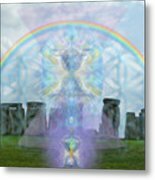 The body outline comes from a meridian picture extensively re-rendered with "multi-vortex chalice chakras"- the later layered in here for color. 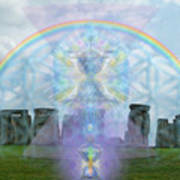 There are no comments for Chalice Over Stonehenge In Flower Of Life And Man. Click here to post the first comment.